Whenever I'm on the road for more than a couple of days, it always feels extra great to be back home sleeping in my own bed and cooking my own food. As much as I enjoy eating out, I truly love to cook and always miss my kitchen! This time was no exception, so last night for dinner I prepared a yummy shrimp stir fry (quick and healthy) and today I decided to have a salad for lunch. Too many meals out usually equals too many unnecessary calories, so I was craving something light and healthy. If that isn't beautiful I don't know what is! Enter my fine friends over at O Olive Oil.. as you probably know I'm a HUGE fan of their artisan vinegars and citrus olive oils. Well, recently they kindly offered to send me a sampling to try and the only problem I'm having is that I love every single one and can't decide which one to use next. Good problem to have, I know. Honestly, some of their vinegars are so good I could literally drink them straight from the bottle. In fact, there are at least a couple that they recommend you could use in cocktails. I'll certainly be giving those a try. Meanwhile, back to the simple salad with the sensational dressing.. no measuring needed, just choose your ingredients, drizzle and toss. Place the mixed greens, cranberries, almonds and apple chips in a bowl. 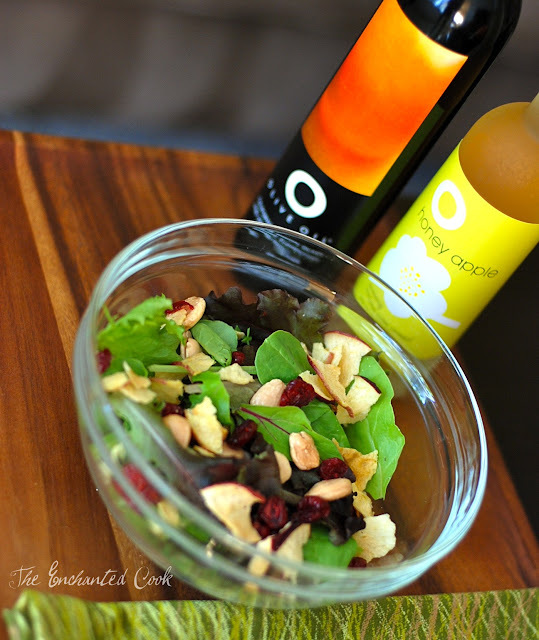 Drizzle O Honey Apple Vinegar and O Clementine Olive Oil atop, toss, and serve. You could add goat cheese and/or chicken for a more substantial one dish meal. If you only wanted to try one of these - either the vinegar or the oil - I'd go with the vinegar in this case. You could certainly get by using regular olive oil, but the Clementine does add a layer of citrus infusion. 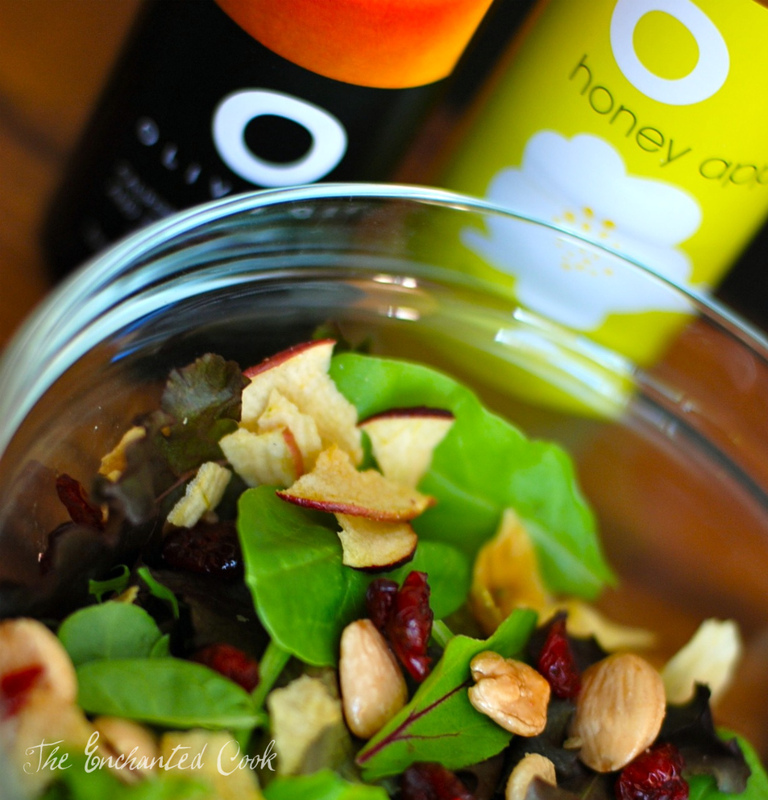 The O Honey Apple Vinegar is just like you might imagine - a smooth and silky apple cider-type vinegar with a hint of sweetness from the honey. The O Clementine Olive Oil has just a hint of mandarin orange infused in the delicious olivey oil. You can find a smattering of O Olive Oil products at various markets, like Whole Foods, Bristol Farms and Gelson's. You can also order online direct from O Olive Oil or from any of the multitude of online stores offering deals. Oh my goodness that looks delicious. And great photos too! Certainly an awesome alternative to the usual boring salad. I'll have to look into trying this when we go grocery shopping soon. great recipe and photos as always! The salad sounds awesome!! There is something about a fresh and light salad that just hits the spot after being on the road. They taste so cleansing and that dressing looks incredible!! Do they sell in VA?!!? Your photos are amazing! Looking forward to trying some of those oils. 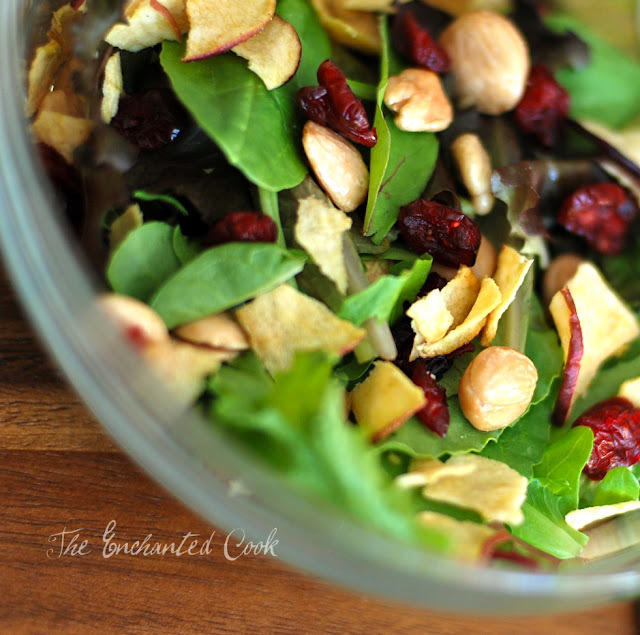 I usually bring salad to family events, and this recipe would be perfect! I get in such a rut with my salads. I love seeing a new simple recipe with a great new dressing! Nice salad! 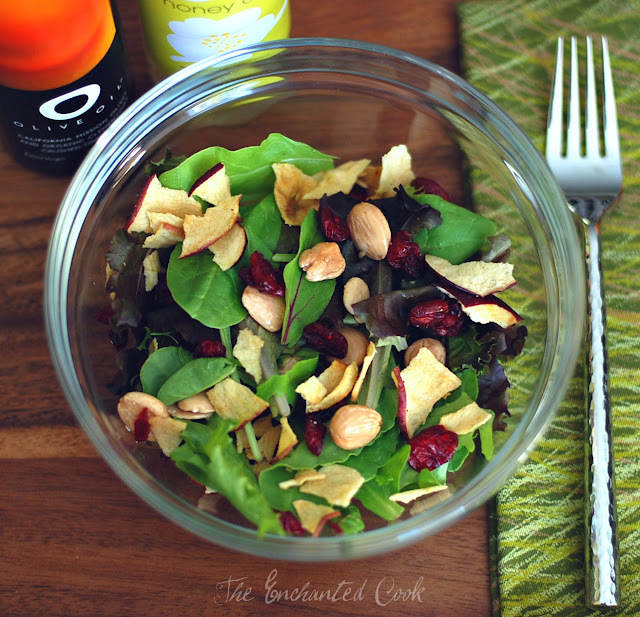 I love and crave salads all year long! I also love vinegars - my current favorite is from Trader Joe's. It's an sweet orange vinegar, and, like you, I could practically drink it! It's that good! I make a salad similar! So good! I've never heard of O vinegar, thanks for the link! Sometimes it's the simplest ingredients that can make a great salad. The olive oil table at the Foodbuzz Festival was great too. Their lemon olive oil was fabulous. It would be super on a salad.